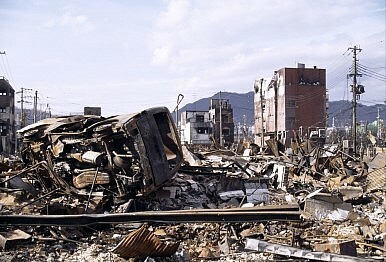 Circa 2011: Damaged town from the Japanese earthquake. A second strong earthquake rattled southern Japan early Saturday morning, around 1:25 am local time. The U.S. Geological Survey (USGS) initially estimated the quake at a 7.0 magnitude (some sources say 7.1), and it came a little more than 24 hours after similarly large earthquakes rattled the same region. The Associated Press reported “collapsed buildings, streets warped by manholes pushed higher by the earth’s movement, [and] an expressway crunched and buckled” after the first quake. Eight of the nine deaths were in the town of Mashiki, 9 miles outside Kumamoto. The AP also reported, after the first earthquake, that the Japanese Meteorological Agency (JMA) said it had been “unusually strong for Kyushu.” Kumamoto prefecture is also the site of Japan’s largest active volcano, Mount Aso. An estimated 44,000 people sought refuge in shelters after the initial quake. A tsunami advisory was issued by JMA after the second quake but was lifted shortly after. Japan, positioned along what’s known as the Pacific Ring of Fire, is no stranger to earthquakes but activity in Kyushu has kicked up in recent days. According to USGS data there have been eight tremors on Kyushu in the past 24 hours–ranging from 4.5 to this morning’s 7.0 quake. Japan accounts for five of the 11 earthquakes listed by the USGS as “significant” in April so far (before April, Japan last made the list in January). A government spokesman, Yoshihide Suga, said there were no abnormalities detected at the Sendai nuclear power plant, 74 miles southwest of Kumamoto in neighboring Kagoshima prefecture. Japan’s Belt and Road Balancing ActJapan’s Latest Deadly Earthquake Buries Scores AliveOsaka Earthquake: Another Political Test for Abe6.9 Magnitude Earthquake Strikes Off Japan, Triggering Tsunami AlertIs Japan Anti-China?